The Hudson offers an entry level resistance swim system in the form of the Monsoon Counter Current Swim System and two therapy seats. The Monsoon System can be used in conjunction with the Tether Resistance Swim System to serve multiple levels of fitness in addition to climate-defying family fun. Select the tabs below to see the wide range of features included in this model, some brilliant optional extras and the modal warranty. It is no secret that winters get a little chilly in Canada. The thought of owning a pool for year-round use doesn't really cross many people's minds. It is only our patented Freeheat Insulation system which makes this a possibility. Refined over the last 3 decades, Freeheat takes its' inspiration from the method of insulation used for northern homes and builds on that premise. 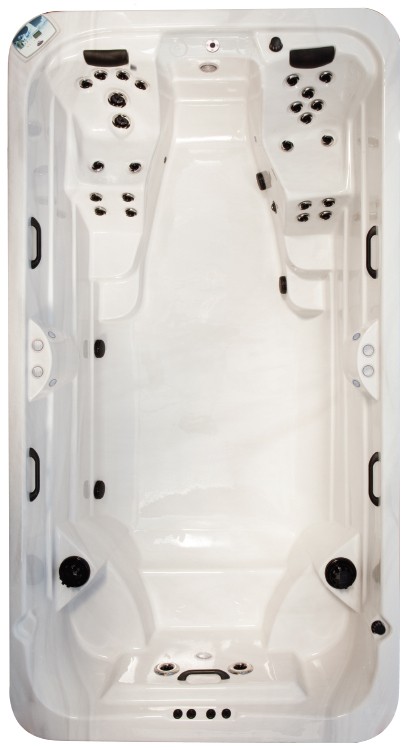 All Arctic Spas ® come standard with insulated removable access panels on all sides of the cabinet. Many companies bury hundreds of potential problems completely in foam, effectively ensuring that service is a nightmare when this foam needs to be removed and replaced to perform any service. Guaranteed to last a lifetime. The shell of an Arctic Spa hot tub is the core of our design, and as such, is uniquely designed to handle this function. We begin by vac-forming sheets of premium Premium Aristech Acylic® Cast Acrylic, transferring thousands of hours of mould design and engineering into a tactile form. A cabinet designed to last as long as a totem pole. Beauty, strength and total access are built into every Arctic Spas cabinet. We construct each cabinet using Western Canadian clear red furniture grade cedar. As Arctic Spas continues to refine our patented filtration systems and develop new ideas, our goal has always been to keep your spa water safe and clean, and to do so with the least amount of work for the spa owner as possible. Because we're inspired by flexibility, we translated this commitment into five different models of All Weather Pool. There are five unique models to choose from, depending on your need for exercise, therapy, family and friends, or all of the above.